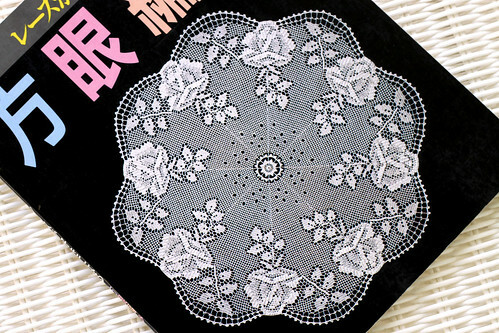 I do not know the real title of this lovely 1990 filet crochet book. It is in Japanese, and I do not read Japanese. I have always wanted to make the doily pictured on the front cover. I have made a few filet doilies before, and it can be tricky getting all the holes square. I gave many filet doilies away before I knew to take photos. I have lots of projects on my “Want to make list”, so I do not know why my thoughts have been consumed about purchasing a new sewing machine lately. I have been spending too much time on the internet researching. Usually at night I talk myself out of it, but the next morning I think, ‘why not?’, and begin looking for more information. I need to sew more and surf the web less. Maybe if I did that I would have more projects crossed off my list. This entry was posted on Friday, October 9th, 2009 at 3:00 am and is filed under Book, Crochet and Doily. Tagged: Book, Crochet, Doily. You can feed this entry. You can leave a response, or trackback from your own site.